The perfect game for delay's before getting on the course or for socializing in the clubhouse after your round. 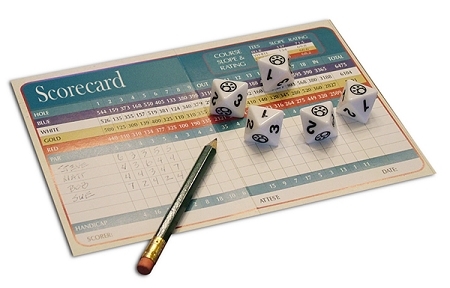 Golfer's Dice is simple, fast and fun. Grab a scorecard and you're set. The game comes with 5 dice. The number of them you roll to begin the hole depends on what par is for the hole you're playing. 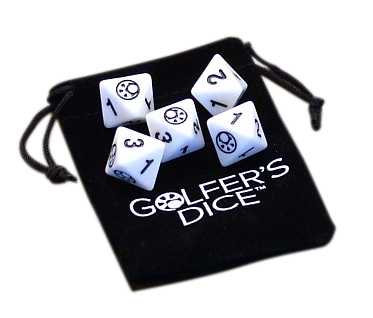 Par 3 - roll three dice, Par 4 - roll four dice, and on a Par 5 - roll 5 dice. You can roll up to three times per hole. The dice you want to roll and keep are the Hole Out dice. These equal 0 strokes. The other dice have a number on them that represents their stroke value (i.e. 2 = 2 strokes). Scoring the hole is simple. Add the number of rolls taken plus the strokes showing on the dice. You can stop anytime after the first roll. 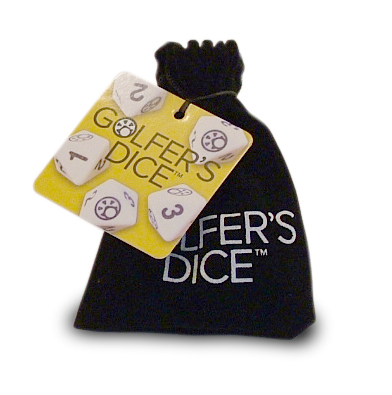 After each roll set aside the dice you want to keep and re-roll the dice you don’t want. Remember that each roll counts as a stroke in addition to the values showing on the dice.